Hanenbow as it appears in Smash. Unlock criteria Clear Event 28: Flower Blooms in the Echoes on any difficulty. Hanenbow (エレクトロプランクトン, Electroplankton) is a stage in Super Smash Bros. Brawl and Super Smash Bros. Ultimate. It comes from a music-themed Nintendo DS game called Electroplankton, which features extensive interactivity with the microphone. The Hanenbow sub-section of this game was also released on its own as Hanenbow on DSiWare for 200 Nintendo Points, or US$2.00 (£1.80) on the Nintendo 3DS eShop. The stage consists of multiple stems with leaves branching out on each stem. It also features the Hanenbows being fired at the stage's platforms, which make a musical note on contact depending on the angle of the platform. The platform's angle, position, and color can be changed by attacking them. Note that the branch on the left can't be stood on (although it serves as the Pokémon Trainer's platform). When all the leaves on the right-most tree are a dark red, a flower sprouts on top of the tree, making another sound effect. This is a key aspect in an event match on the stage, as the flower must be sprouted while avoiding Olimar's attacks as Peach to clear the event and unlock Hanenbow. This stage is the one of only two in Brawl where a character can't swim in its water, the other being Corneria. This stage is also the only one to have completely interactive music that cannot be altered in the music settings. Individual sound effects can be listened to in the Sound Test, but an overall piece does not exist, outside of subtle ambient music. All characters in this stage and the stage itself are in 2D, like on the Flat Zone line of stages and Pac-Land. In Super Smash Bros. Ultimate, the Ω form and Battlefield form are set on a platform that is suspended in the air and is the same size and shape as Final Destination and Battlefield, respectively. The main platform itself aesthetically resembles the branches of the normal form. The three soft platforms of the Battlefield form resemble yellow, orange, and red leaves of the normal form. The characters are still flat, which also flattens the hitboxes and alters gameplay significantly as a result. One tier of Hanenbow as first seen in Electroplankton, showing where the main platform arrangement originates. Another tier of Hanenbow, showing where the upper platform arrangement originates. Electroplankton is an interactive music video game published by Nintendo for the Nintendo DS. This game allows the player to interact with animated plankton and create music through one of ten different interfaces. One of these was called "Hanenbow". Within the Hanenbow interface, there are ten more variations of the Hanenbow appearance, with different positions of leaves in each. The Brawl stage Hanenbow merges two of these tiers. 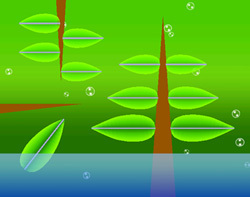 The primary platform arrangement in the Brawl stage is a tree growing out of the water, which originates from one tier of the Hanenbow interface, while the other platform arrangement in the Brawl stage is a smaller tree growing from the top of the screen, which is part of a tier featuring three of these, with one tree in the same position as it is in Brawl. There is one more platform in the Brawl stage, which is a singular leaf in the water. The color of this leaf cannot change, and this platform serves as the cannon for the Hanenbow creatures. This leaf is in the same position in all ten tiers of the Hanenbow interface of Electroplankton. When a Hanenbow hits a leaf in Brawl, it makes a sound just like it did in Electroplankton - the sound is based on the speed of the Hanenbow and the angle of the leaf. The leaves change colors when they are hit either by an attack or by a Hanenbow, while in Electroplankton, only the Hanenbow creatures can change the color of the leaves. The leaves change color progressively from green, to yellow, to orange, and then to red. If the leaves are left without being attacked, their color will revert to its previous state. If all leaves turn red in Electroplankton or the Hanenbow stage in Brawl, a flower will sprout at the top of the central tree. When the Hanenbow hit the water, they sink. This is likely the reason characters cannot swim in the stage's water. 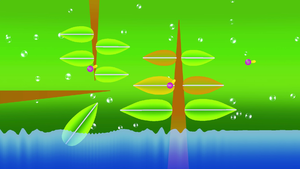 The stage being completely 2-dimensional in Super Smash Bros. is likely a reference to the paper-like art style of Electroplankton, or just generally because a sideways leaf would make for a strange platform. This stage is banned in tournaments due to irregular stage design that makes it difficult to traverse, ungrabbable ledges, being overly large, and powerful camping spots, particularly on the bottom left leaf. The sloped leaves can also negatively affect gameplay. An assembling Dragoon, Snake's taunts and Final Smash, and the Ice Climbers' Final Smash (along with "sparks" that appear when a character is hit) are the only things in 3D, but effects such as the reflections on the Landmaster and Samus's armor still look as though they are 3D. Whenever a player gets Star KO'd or Screen KO'd, both the character and the effects fly off separately. This can be best seen from Olimar's beacon, the flame on Charizard's tail, and when the player is frozen. This also happens in Flat Zone 2. This stage has no My Music in Brawl, even though an ambience track can be found in the game's data. In Ultimate, however, both the ambience track as well as a new remix for the stage are available in My Music. If Sonic or Jigglypuff stands on either of the two leftmost platforms on the top or the leftmost platform on the bottom and uses Spin Dash, Spin Charge or Rollout, they will go flying directly to the right and off the stage. This is called the Spin Glitch. When a fight begins, the sound of a full orchestra tuning (as in the opening of Electroplankton) can be heard. This sound effect plays on the title screen of Electroplankton, as well as the title screen of Hanenbow's solo DSiWare release. In Super Smash Bros. Ultimate, Hanenbow is not used for any character's Classic Mode route in any form. Piranha Plant spitting poison on Hanenbow. This page was last edited on April 16, 2019, at 16:01.